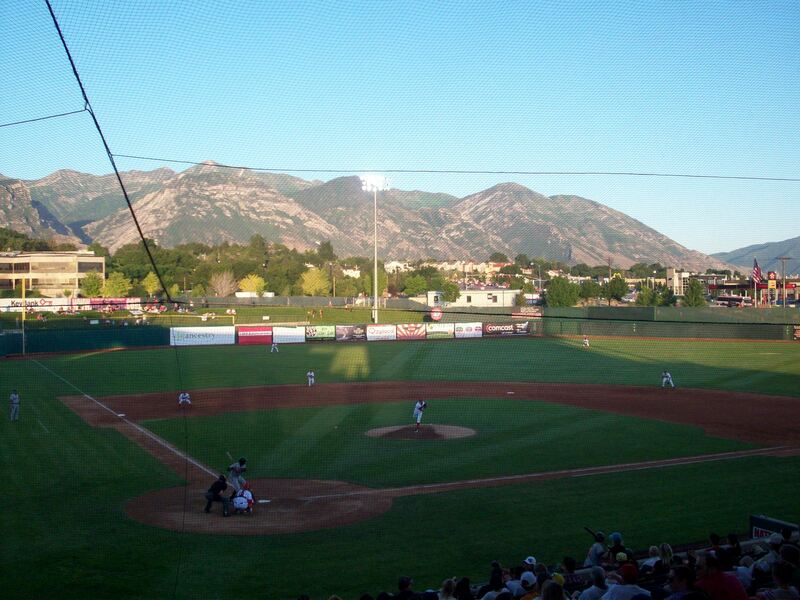 Ballpark Basics: A small town ballpark that’s home to a majestic view, and two local teams. Ballpark Breakdown: The Provo Angels were looking for a new home, and a local university was looking to make the jump to Division I with their sports department. Looking for a way to keep both parties happy, the city of Orem decided to build a new ballpark on the campus of Utah Valley University for both teams to share. 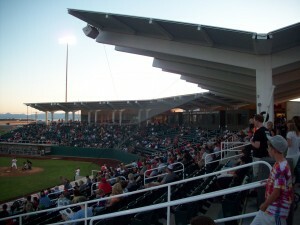 When the park opened March 24, 2005, the intention was to call it Parkway Crossing Stadium after an apartment complex that agreed to pay for the naming rights. When the complex failed to pay up, the Owlz started calling it simply “The Home of the Owlz”; meanwhile the university continued to use the Parkway Crossing name. Confused yet? That is when local auto dealer Brent Brown and his wife Kim stepped in. Agreeing to pay $1 million over 10 years, the park is now named the Brent Brown Ballpark. 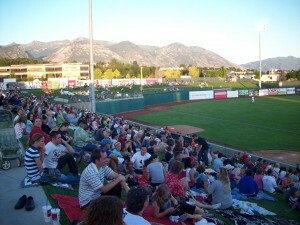 Situated right off the interstate I-15, it is an easily accessible ballpark and a quick drive from Salt Lake City. For a ballpark with such a beautiful backdrop, the entire place is surrounded by concrete. With I-15 on one side and a sea of parking lots on the other, there is not much to do before or after a game (except park your car). Plus, since the parking lot for the Owlz is also the parking for the college, there is a ton of parking but they have devoted only a tiny bit for Owlz fan and they charge you four bucks to park there. Although you can get $2 back in Owlz Cash – at least on the night we were there. Everywhere else in the sea of empty (and free!) parking spots are signs warning that you will be ticketed or towed if you don’t display a student parking pass. Always looking for free alternatives, we wedged ourselves in a cluster of cars with student stickers, crossed our fingers and hoped the car would still be there upon our return. Our fears were slightly allayed when trekking through the huge lot we discovered many other cars brazenly defying the tow signs as well. A long concrete sidewalk leads you from the parking lot to the main entrance, which is along the third base side. Next to the ticket office the gates open up to a nice large open concourse. To the left you will find a large play area for the kids with a playground and inflatable games. The playground is free to all kids and protected by a large net. Right next to the playground is the Owlz BBQ Perch that has picnic tables. There is berm seating that starts down the third base side and wraps around the outfield to center field. Once again, this appeared to be one of the most popular places for Utahans watch the game from. To the right is the seating area that wraps around the infield. The top rows and the concourse are covered by a Y-shaped roof that gives the entire ballpark a nice open feel. Where you choose to sit in the ballpark has a great affect on your view. Down the first base line you have Mount Timpanogos and the rest of the Wasatch Range as your backdrop to the ballpark. If you are seated along the third base side, you get a lovely view of I-15 instead. It is really unnecessary to add, but we recommend sitting along the first base side. Luckily the blazing, late setting Utah sun sets behind the ballpark, so you really aren’t staring into it unless you sit in the outfield berm. Thanks to the high reproductive rates across the state, this is a very family friendly park with lots of activities, giveaways and entertainment. It is easy to get to, affordable, and has a majestic backdrop (assuming you avoid the third base side seating). But for those of you who are more fans of the “brew” half of this website, take note: another aspect of the ballpark being on a college campus means that it is a dry ballpark. No booze are sold anywhere. 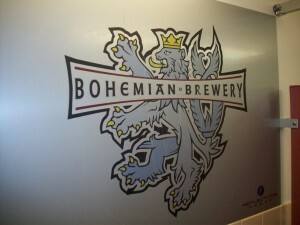 Brew Basics: Stepped out of the heat…and into Bohemia. Looking more like it belongs somewhere in the Alps than in a small Utah town, Bohemian Brewery is housed in a very traditional Bavarian building that could easily double as a ski lodge. 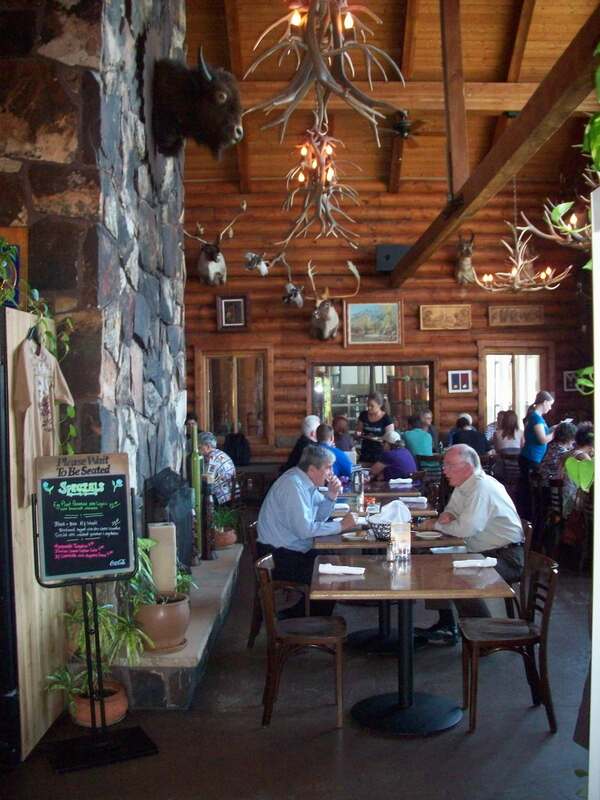 Aside from a huge brewing tank adorned with the brewery’s logo, the exterior of the building is made in a simple log cabin design, with interlocking wood logs and two story windows. A porch runs along the front between the main doors and the parking lot with tables designed for days much cooler than the July heat wave we experienced. Step inside and you are may feel as if you really are in Eastern Europe. 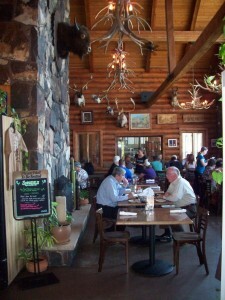 The interlocking logs are visible on the inside as well, and a two-story stone fireplace adds to the ski lodge feel. On the first floor there are seating for parties of all sizes and a well-populated bar in the far corner. Coasters line the walls in this area, providing much to look at, and several conversation starters as well. 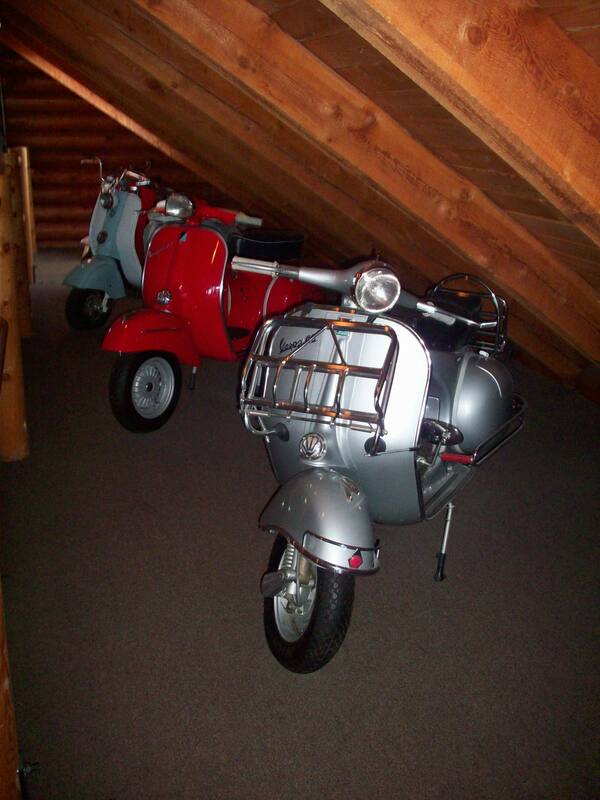 The rest of the interior provides equally entertaining décor, including all sorts of mounted heads, large chandeliers made mostly of antler, family crests, pictures of the “old country”, and a unique collection of antique scooters upstairs. While we’re on the subject, the upstairs is a neat loft area that gives a great view for diners and a great workout for servers who are constantly traipsing up and down the stairs. The brew works are visible through windows from the main downstairs area (kind of like watching your car at a car wash) and includes two 60bbl fermenters. 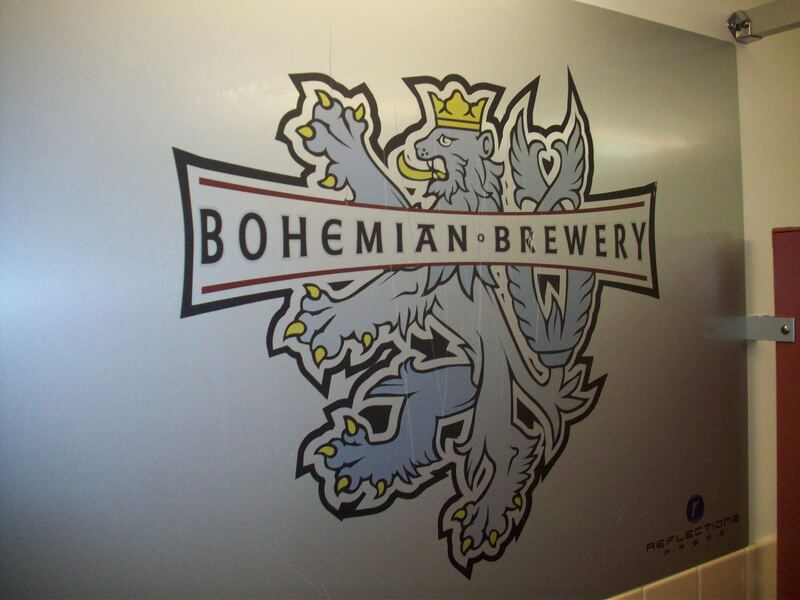 Along with on-site brewing, Bohemian is available for a host of events, from a post work happy hour at the bar, to date night, large parties, and even wedding receptions. The menu is – of course – heavily laden with traditional Barvarian favorites (think paprikash, schnitzel, and my favorite, spätzel) but contains typical American selections as well. We did eat dinner there, and while the food was good – we much preferred the beer. Bohemian brews only lagers, so following German tradition, their beers ferment at almost freezing temperatures for at least 8 weeks, which makes them different than a more traditional (British) brewing style which ferments for about a quarter of that time at and at a bit of a higher degree. Czech Pilsner – This lager comes with a classic ale color and strong malt and yeast smells. It has moderate to even medium – high carbonation which helps maintain a fuzzy white head. The bouquet and palate are similar in that they are yeasty and full bodied with crisp notes. Not a spectacular beer, but simple and clean. Bavarian Weiβ – Has a unique color that is like lemonade but with a bit of a haze. Very faint aroma and equally thin mouthfeel. What there is though is a crisp, clean taste that is lighter on the palate with hints of lemongrass in the clean finish. High carbonation. Not the best, but was still fun to write up since I got to use that weird b shaped letter for the first time ever. Viennese Lager – We actually found this one first at a gas station when we stopped to fill up, then at the brewery itself a few days later. (Cheers to Bohemian: It was the only form of local beer available even though we were in Salt Lake). The Viennese pours a cider colored with moderate carbonation. The hops come through in the aroma and are a key part of the palate as well. Malts kick in upfront and blend with the grains in this full-flavored beer. Birdseye Rye – The seasonal on tap when we stopped by. It has a golden bronze color and high carbonation which produces a long lasting head. The rye is very pronounced in the bouquet, but is much more muted in the flavor which creates sort of an “all bark, no bite” situation. Ideal for someone who is new to rye beers, or who doesn’t like the sour taste that rye lends to a lager. Cherney Bock – Smooth and very dark with a nice bit of head on it. Lighter mouthfeel but thick, with a robust malty aroma and solidly coffee taste and a slight nutty flavor in the sip. This is by far the darkest of the offerings and is a good option for someone looking for more a more “portery” selection.